Get ready to start your Michigan course! Access your Michigan Driver Improvement Course anywhere, anytime from any device. Created by the famed Improv Comedy Club, our Improv Driver Improvement Course provides a convenient and cost-effective way to complete your defensive driving course online. Based on a simple notion that a DOS Approved BDIC Online doesn’t have to be dry and boring, our DOS Approved Course has undergone numerous studies which proved our edutaining approach is effective in reducing future tickets and accidents. We are pleased to be certified by the State of Michigan for our Michigan Driver Improvement Course. View our certification. Take advantage of our free express registration to get going in less than one minute. We are confident you will like the simplicity of our BDIC or defensive driving course, but want you to be your own judge. No commitment. No risk. Just sign up today, choose from a variety of a la carte options, and then make your payment. Enjoy your course right away. Completions are electronically reported on your behalf to the Michigan Department of State on a daily basis. If you are taking the course for an insurance reduction, then you will be able to download the proof of completion certificate within 30 minutes of completion and submit it to your insurance agency. From students who took our Driver Improvement Courses in Michigan. I found this course to be fun and interesting… Would recommend it to someone how needs to take an online driving school. When my son is ready to drive, I will enroll him in this course on-line as great learning tool. This online traffic school was very simple to use. This was an excellent course and a great reminder about how important it is to follow safety while you are driving. There were some items of which I was not aware. It certainly did help me. Thank you. Being able to complete the course on my schedule rather than someone elses made it more enjoyable. I loved that I could do this at home – it was very convenient and informative. 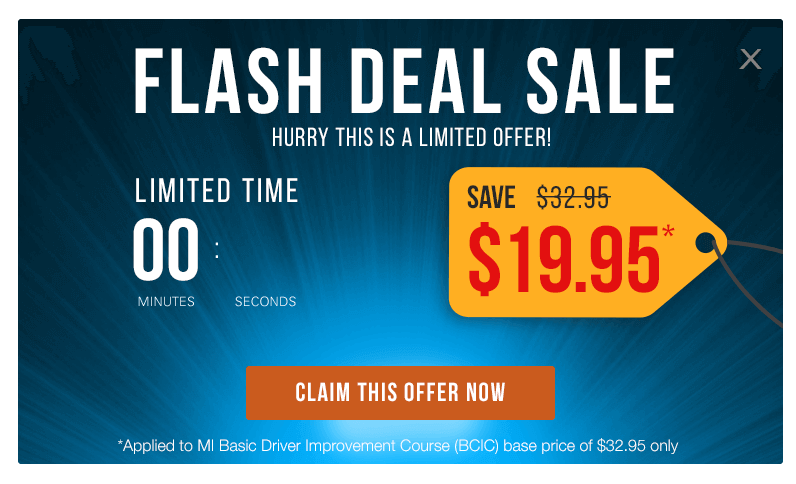 Very good internet based defensive driving course. Will recommend to anyone. I will always choose a flexible internet course over a classroom. This was a great course because I could do it on my schedule. I finished it over 3 days during a weekend. Thank you, I will recommend your course. I really enjoyed the refresher course. I think everyone would benefit from taking this class. It’s all common sense driving, but I think over time, we all forget a few things. Thanks for the reminder! I enjoyed the comedy in this, it made it a lot easier to get through. I’m glad I picked this class it was educational and easy to work through and understand the information. This made traffic safety more interesting than it would normally be! Driving points from the citation may be waived. If the DMV has made the course a requirement, you satisfy it. Car insurance rates may not be raised, if your insurance company sees that you are a responsible driver. If you complete a driver improvement traffic school, you may be eligible for an insurance premium discount. The refresher gives you a good chance to become a better driver - reducing traffic violations and preventing accidents. This page shows Michigan traffic schools, options for course completion, and what to do with your Michigan Defensive Driving certificate when you pass the course/school. Prevent your driver's license from being suspended. Earn a discount on your vehicle insurance premiums. You can take traffic school either online or in person. Michigan Defensive Driving courses online enable you to study on your own time and at your own speed. Your driving record shows only two points or less. You hold a valid driver's license that is non-commercial. The ticket you received counts 3 points or less and is for a non-criminal offense such as tailgating, running a traffic light/stop sign, or speeding. If you take the driver improvement program you must complete it within 60 days. The course provider will alert the Michigan DOS that you have met their completion requirements. For those not eligible to dismiss their ticket via the basic driver improvement course, your driving record will reflect the increase in points, which may result in suspension of your driver's license if you have too many points. Taking Michigan Defensive Driving traffic school voluntarily will most likely set you up for a decrease in insurance premiums. It shows you as a serious safe driver, who may qualify for a discount, regardless of age. For more information, contact your auto insurance company. Basic driving and safety techniques. Traffic laws and their equivalent violations. How to share the road with others respectfully. The consequences of alcohol and drug violations.